Tate, T., Warschauer, M., & Kim, Y.-S. G. (2019). Learning to compose digitally: The effect of prior computer use and keyboard activity on NAEP writing. Reading and Writing, (), 1-24 DOI 10.1007/s11145-019-09940-zWriting is critical for college and career readiness, yet secondary students in America are not good writers (National Center for Education Statistics, 2012 ). Unfortunately, researchers know relatively little about secondary students’ writing skills, and even less about their digital writing. In this study, we explored prior computer use, keyboard activity during writing, and their relations to writing achievement using the 8th grade 2011 National Assessment of Educational Progress writing assessment, the first national computer-based writing assessment for U.S. secondary students. 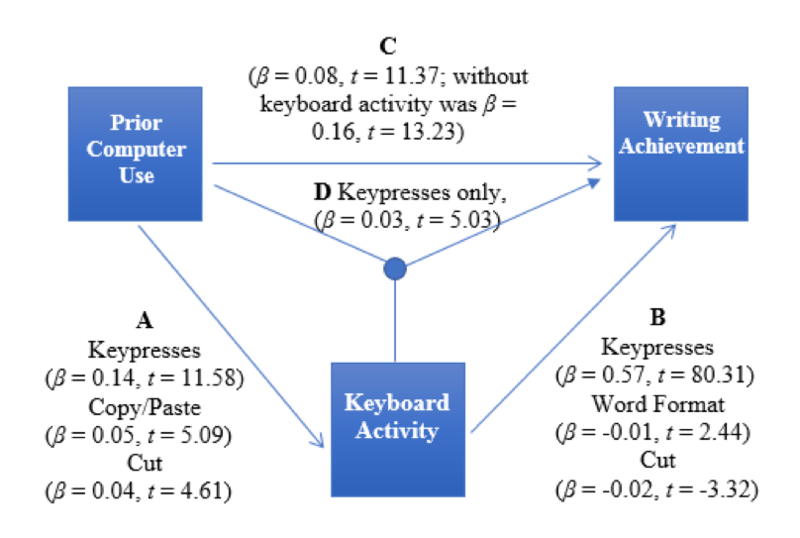 We found that prior computer use predicted students’ writing skills directly (0.08) and indirectly (e.g., keypresses, 0.14) via keyboard activity during the test. We found differential effects for certain groups including current English learners and disadvantaged students. We also found a small positive interaction effect of prior use and keypresses on writing. That is, the benefits of prior computer use for school writing and the value of students’ additional keypresses on writing achievement were amplified when both were present. Seventh and eighth grade students in a within-teacher randomized control study read from visual-syntactic formatted text for 44 minutes per week over the course of a year. On the annual state assessment, we found small statistically significant improvements on the overall English Language Arts scaled score (ES = 0.05, p<.05) and the writing assessment (ES = 0.07, p<.01) for the treatment group compared to the control group. We found no interactions between gifted, special education, or English learner classification and treatment status on the effect on overall ELA score, but our categorical and subgroup analyses showed that the use of VSTF provided a modest benefit to middle school students who were near or at grade level in the prior school year. ​Tate, T. & Warschauer, M. (2108). Going Beyond “That Was Fun”: Measuring Writing Motivation, Journal of Writing Analytics, 2, 257-279. The use of validated measures of writing motivation is imperative to improving our understanding, and development, of interventions to improve student writing utilizing motivation as a mechanism. One of the most important malleable factors involved in improving student writing is motivation, particularly for secondary school students. This note systematically examines the measures of writing motivation for students in grades 4-12 used by researchers over the last ten years and summarizes their psychometric and measurement properties to the extent provided in the underlying literature. This collection of measures and their properties and features is designed to make researchers more aware of the various options and to point out the need for additional measures. Tate, T., Warschauer, M., & Abedi, J. (2016). The Effects of Prior Computer Use on Computer-Based Writing: The 2011 NAEP Writing Assessment, Computers & Education, 101, 115-131. Writing achievement levels are chronically low for K-12 students. As assessments follow the transition to computer-based writing, differences in technology access may exacerbate students’ difficulties. Indeed, the writing process is shaped by the tools we use and computer-based writing is different from writing with pen and paper. We examine the relationship between reported prior use of computers and students’ achievement on the first national computer-based writing assessment in the United States, the 2011 National Assessment of Educational Progress (NAEP) assessment. Using data from over 24,100 eighth grade students, we found that prior use of computers for school-related writing had a direct effect on writing achievement scores on the computer-based NAEP assessment. One standard deviation increase in prior use led to a 0.14 and 0.16 standard deviation increase in mean and scaled writing achievement scores respectively, with demographic controls and jackknife weighting in our SEM analysis. We also looked at earlier NAEP assessments and found that prior computer use did not positively affect the earlier pen and paper-based writing assessments. Tate, T.,& Warschauer, M. (2018). Digital divides and social inclusion. In K. Mills, A. Stornaiuolo, A. Smith, & J. Pandya (Eds. ), Handbook of Writing, Literacies, and Education in Digital Cultures (pp. 63-75): Routlege. Tate, T.,& Warschauer, M. (2017). Computer Access in the Home. In K. Peppler (Ed. ), The SAGE Encyclopedia of Out-of-School Learning(pp. 120-121). Thousand Oaks, CA: Sage.